Has been providing the most traditional Greek atmosphere in London, Ayia Napa eat your heart out!!!! Many office and personal Christmas parties throughout December. Several packages available. Full greek meze, lots of food and drink all night. Christmas decorations and extras included. Wide Selection of Vegetarain Dishes. 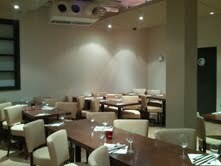 Welcome to the new Fantasia Palace, a popular Greek restaurant based on 28 Praed Street in the Paddington area of London. After work or school, you will mostly find the Greeks in a CafÃ©-bar-restaurant, where they have a âFrappeâ (iced coffee), talk, play backgammon, or just enjoy a drink and good food.